The phrase never again has been used for decades as a symbol of international resolve to never allow an abomination like the Holocaust to happen again. All nations seem to recognize an obligation to stop future genocides and mass atrocities, even if it means violating the near-sacred sovereignty of another country. That resolve has been tested many times, and too often it has failed. Since the Holocaust we have seen mass killings take place the world over. In some cases the slow, deliberate killing of innocent people may have only captured the news media’s attention on occasion, leaving us with the impression that mass killings only happen in the context of war. What might have seemed like isolated incidents are symbolic of a larger epidemic. Mass violence is a political tool used by those with power for their own strategic objectives. It is not an unpreventable and unmanageable explosion of existing tensions. Ethnic and other social divisions can be manipulated by the powerful, but genocide and mass atrocities don’t occur spontaneously. And that means they can be prevented. 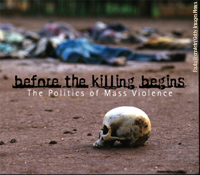 Now Showing Before the Killing Begins: The Politics of Mass Violence considers how early preventive strategies by governments and the international community should build much-needed capacities within countries, and make it harder for leaders to resort to violence. It aims to encourage discussion of how future efforts might better protect populations under threat, giving new resolve to the promise of never again. "Courier: Break the Silence on the Genocide"—a publication from the Stanley Foundation that includes articles on the complex relationship between mass atrocities and armed conflict, how stopping deliberate and systemic murder recently became explicit US diplomatic priority, and how Liberia elections will test the country's fragile peace. "Preventing the Next Mass Atrocity"—a Courier article looking at how the US and UN strive to build better systems to prevent human tragedy. "Atrocity Prevention and US National Security: Implementing the Responsibility to Protect"—a policy dialogue brief from the Stanley Foundation looking at ongoing efforts to elaborate the US government’s strategic approach to genocide and mass atrocities, exploring next steps for effective institutional development, and encouraging strategic dialogue between US institutions and their multilateral partners at the United Nations. "Mass Atrocities and Armed Conflict: Links, Distinctions, and Implications for the Responsibility to Prevent"—a policy analysis brief from the Stanley Foundation by Alex J. Bellamy, Professor of International Security at the Griffith Asia Institute/Centre for Governance and Public Policy, Griffith University, Australia. "Preventing mass atrocities: An agenda for policymakers and citizens"—a series of policy briefs from the Prevention and Protection Working Group, based in Washington, DC, that spells out some of the actions that US policymakers could take to create the tools government needs to help prevent genocide and massive human rights abuses. "The peacebuilders: Making conflict resolution permanent"—an article from the Christian Science Monitor by Jina Moore looking at UN peacebuilding efforts in Africa. Citizens for Global Solutions believes that, despite promising measures taken, further action and continued commitment remains necessary to ensure that the United States can act swiftly, cooperatively, and decisively to confront the horror of genocide worldwide. They have resources available on genocide prevention including reports, fact sheets, and white papers. They also offer action-oriented tools. The Enough Project is helping to build a permanent constituency to prevent genocide and crimes against humanity. Through analysis, advocacy, and activism, they work to change the way the world responds to these crises. The project’s blog and intensive field research in areas afflicted by mass atrocities are among resources available. Genocide Intervention Network empowers individuals and communities with the tools to prevent and stop genocide and is mobilizing the first permanent antigenocide constituency committed to stopping the worst atrocities around the world. They have speakers available, offer a genocide monitor, and maintain a blog along with other resources. Human Rights First seeks to improve responses to particular cases of mass atrocities and to contribute to the establishment of effective mechanisms to halt crimes against humanity through research, analysis, public education, and advocacy. To improve governments’ responses to mass atrocities, Human Rights First targets enablers of those crimes. International Coalition for the Responsibility to Protect brings together nongovernmental organizations (NGOs) from all regions of the world to strengthen normative consensus for the Responsibility to Protect (R2P); further the understanding of the norm; push for strengthened capacities to prevent and halt genocide, war crimes, ethnic cleansing, and crimes against humanity; and mobilize NGOs to push for action to save lives in R2P country-specific situations. Resources include a listserv that offers breaking news, policy analysis, featured publications, speeches, events and other information related to R2P. Preventing Genocide, a project of the US Holocaust Memorial Museum, offers a number of action-oriented resources including podcasts, an e-newsletter, and a blog. The museum’s work on genocide and related crimes against humanity is guided by the Committee on Conscience. The Genocide Prevention Task Force final report and other related resources can also be found here. Stop Genocide Now seeks to change the way the world responds to genocide by putting a face to the numbers of dead, dying, and displaced. They offer a blog and many options for taking action against genocide. The Stanley Foundation is focused on coherent, strategic approaches to pre-crisis atrocity prevention; capacity-building tools; and greater international coordination for post-conflict peacebuilding, genocide prevention, and response. Policy analysis, articles, and multimedia resources are available. Voices of Rwanda is dedicated to recording and preserving testimonies of Rwandans and to ensuring that their stories inform the world about genocide and inspire a global sense of responsibility to prevent human rights atrocities. See testimonials from victims of the Rwandan genocide.